WHAM-TV anchor Don Alhart, center, spoke with four RIT presidents, left to right, M. Richard Rose, Albert Simone, Bill Destler and David Munson, to commemorate RIT’s 50 years on the Henrietta campus. When M. Richard Rose became president of Rochester Institute of Technology in 1979, he remembers the campus was still fairly new and growing in its Henrietta location. 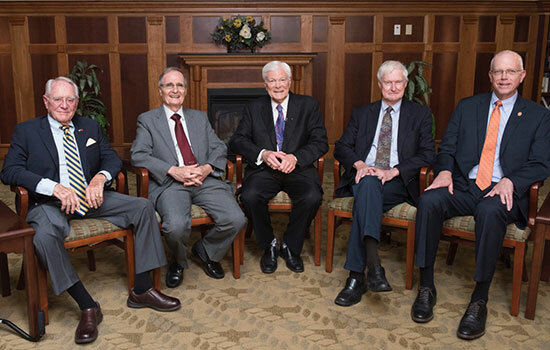 Rose and the three RIT presidents who followed him—Albert Simone (from 1992 to 2007), Bill Destler, (2007 to 2017) and David Munson (2017 to the present)—gathered together recently to reflect on RIT’s 50 years in Henrietta and the impact the university and its students, alumni, faculty and staff have made. Hosted by WHAM-TV anchor Don Alhart, a 30-minute special of the reunion can be seen at 9 a.m. Sunday, Oct. 14, on WHAM-TV, and 7 p.m. Tuesday, Oct. 16, on WUHF-TV. It may also be seen on the Henrietta 50 website in its entirety after it airs. It is the third such interview Alhart has hosted with groups of RIT presidents—the first, in 1992, included Mark Ellingson, who was RIT president from 1936 to 1969 and saw RIT’s campus move to Henrietta in 1968. Rose, who started RIT’s microelectronics program, recalled students took off classes on May Day to plant trees to counter the stark look of the brick buildings on campus. Rose also saw to it that a tiger statue was erected. “The RIT tiger wasn’t visible on campus. I thought that was a necessary identification,” he said. Simone, who helped launch RIT’s international campuses, came to RIT from the University of Hawaii, where he was president. “There’s something that can be said about the four seasons,” Simone said. Simone liked the spirit and opportunity that he saw at RIT. “There was a sense of ‘we can do it.’ I like to take risks. Calculated risks are important,” he said. As the new kid on the block, Munson said he came to RIT last year knowing it had a good reputation for creativity and innovation, and had enormous potential. He called RIT “a complete university” that is changing the world. Simone said the sense of family on RIT’s campus will continue to encourage new ideas. Destler believes RIT’s growth is allowing it to take its place among the nation’s greatest universities. Munson said RIT continues to work—often behind the scenes—trying to attract new firms to Rochester that are eager to set up shop close to the skilled pool of multi-disciplined talent RIT is producing.